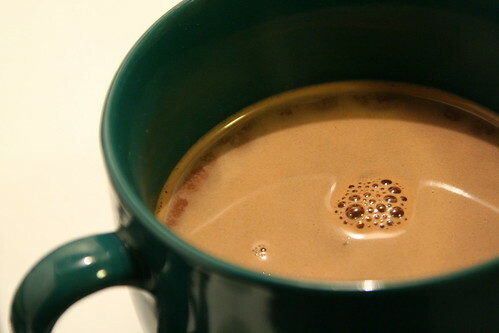 Hot cocoa is one of those things that I've always loved but it has certainly never loved me back. The last time I had some, it was Swiss Miss with a little Bailey's and Dr. McGillicuddy's. Tasted amazing. Felt horrible. Recently I saw a recipe for dairy free hot cocoa somewhere and it's been stuck in my head since. Tonight I was chilly and craving something sweet and I have a box of coconut milk in the fridge that needs to be used up. I searched around the internet for recipes and most of them were basically the same so I just randomly picked one and followed it with my own modifications. I didn't let it heat up enough because I was afraid of scorching it, I'll do it better next time, but the taste was rich and delicious! I heated the water in a hot shot first, then in a small saucepan combined the hot water, cocoa, sugar and salt. Stir this mixture together until it's nice and hot but be careful not to let it burn. Add the milk and stir until very hot, but not boiling. Remove from heat and mix in the vanilla. Next week begins our Biggest Loser at work challenge, so obviously I'm overloading on junk this week. I will probably try to make biscuits before the weekend is over. Maybe a creamy chicken recipe? YES. Definitely. Stay tuned!! Yum, yum, yum! I've been drinking So Delicious coconut milk hot cocoa every night for the past few weeks! It doesn't get any better than this, does it? I have just started dairy free (been GF for 7 mo). I wonder if you could make this adding coconut cream to make it thicker? Have you ever experimented with that?